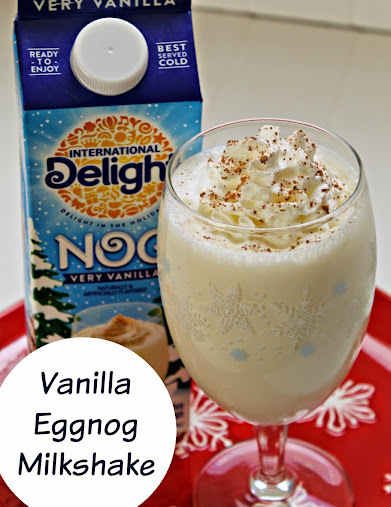 This vanilla eggnog milkshake recipe is a partnered post with International Delight. All words, thoughts and recipes are my own. If you’ve been around this week you may have heard that I’m kind of in a milkshake mood (and before you get all excited, Mom, that doesn’t mean I’m having cravings). And while a good chocolate shake will always be top of my list, I do like to experiment with different flavor combinations, especially seasonal ones. And what’s more seasonal right now than eggnog? Growing up I wasn’t that much of an eggnog fan. Or a fan at all to be more accurate. And hubby said he didn’t like it much, either. But as you age, your tastes change, and I thought it was time for us to give it another chance. 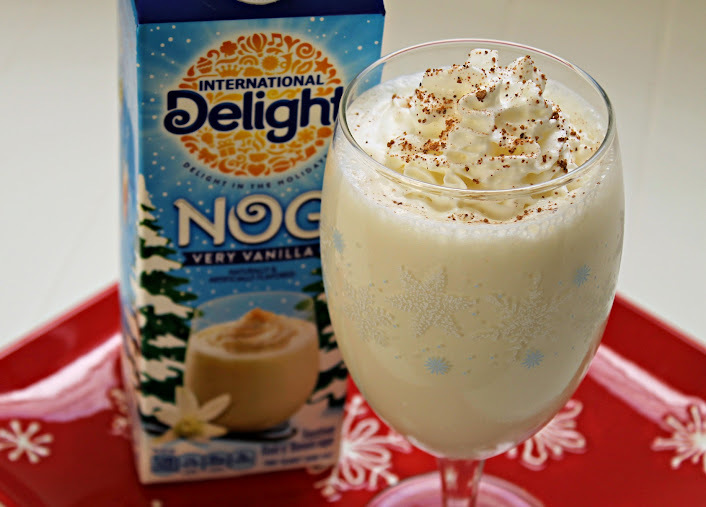 When I saw the International Delight Very Vanilla Nog at the store I knew that would be the perfect chance for us to reintroduce our taste buds to the flavor of eggnog. It ended up being really good! So good that I decided to substitute it for the milk in my milkshake that night. Add all ingredients to a blender. Pour into a glass. Top with whipped cream and a sprinkle of nutmeg. 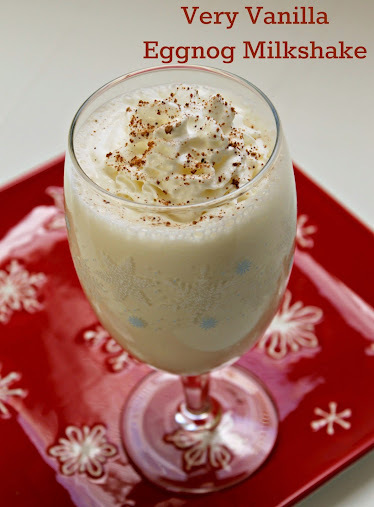 This eggnog milkshake is perfect for holiday entertaining. Can’t you see your friends and family standing around the fireplace sipping one? Or instead of milk and cookies for Santa, what about milkshakes and cookies? I personally think Santa would love a little variety in his night! For other recipe ideas be sure to take a peek at International Delight’s Pinterest boards. You’ll of course find recipes and coffee-inspired ideas, but you’ll also find Christmas crafts, ideas for decorating the house, and much more. Another good site to check out is the International Delight Member Delight’s page where you’ll find coupons, contests and other fun. What other ways do you like to serve eggnog? This is a sponsored conversation written by me on behalf of International Delight. The opinions and text are all mine. Liza is a mom (5-year-old daughter, 20-year-old stepson, and 24-year-old stepdaughter) and wife living in Louisville. She loves spending time with her family, visiting the local zoo and parks, as well as planning travel adventures. Cooking and baking, DIY projects and crafts, and coffee - lots and lots of coffee - round out some of her other hobbies. This sounds amazing and one I must try this year. To tell you the truth I have not had eggnog in years. I love eggnog! This sounds a little different though and I would love to try it too!